Unfortunately, when it comes to our teeth, the body does not have the same amazing ability to repair them as it does with other parts of the body. Although, we are get two sets of teeth in our lifetime, once a hole forms in the tooth, it needs the attention of a dentist. Quali-Dent is able to professionally remove the bacteria, known as a direct filling and replace the hole in the tooth with a hard, tooth-like material known as a dental filling. 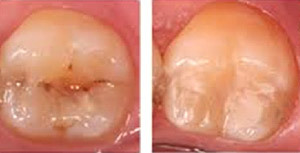 It is Quali-Dent’s aim to always restore your tooth back to its healthy state.. The first step Quali-Dents takes prior to commencing work for a filling is to make sure our patients are comfortable. We understand getting “the shot” is usually a patient’s biggest fear. Injections have a reputation for being painful however; we trust our skillfulness along with our empathy towards your fears will make this procedure more endurable. The first thing Quail-Dent does when preparing a patient for a filling is to rub the area where the injection will be given with a numbing gel. Once you’re numb and your mouth is ready, the dentist will begin to remove the portion of your tooth that was damaged due to tooth decay.